Mexican chorizo sausage, made with just a bit of paprika and vinegar, carries a unique taste you will crave after your first bite. Add it to meatloaf for a spicier dish or stir it into hamburgers for totally new flavor. You will love it sautéed with potatoes for a hearty morning meal. Get out of your comfort zone with Premio Mexican sausage. You can sum up the experience of Mexican chorizo sausage in one word — wow! This sausage is different from anything you may have tried before. Tasting of vinegar and paprika, it is a fattier sausage than Italian or breakfast varieties. That means it can hold in even more flavor. It’s a party in your mouth when you take a forkful of Mexican chorizo, and it’s not an experience you will forget anytime soon. 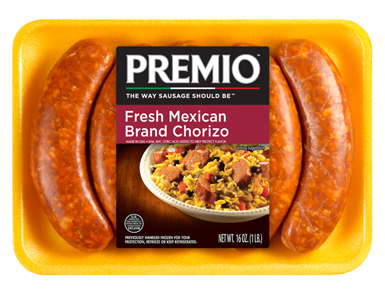 In fact, you will want to add Premio’s chorizo to many meals. Mexican sausage is traditionally made from pork, though some street vendors add beef as well. Premio uses pork, as well as onion and garlic powders to help bring out its distinctive tang. We don’t put any MSG in our sausages, and you can enjoy them on a gluten-free diet because all of them are made without any wheat products. Those choices are part of our commitment to providing quality products to all of our customers. We built Premio Foods on the promise that we will always show devotion to our customers, our community and our employees, and we do that by putting quality first. We never use fillers in our sausage. Everything in our Mexican chorizo is natural, so you can feel confident when you feed your family Premio products. We give you nourishing food you can feel good about. Family gatherings take a lot of planning, but the payoff is so much fun. When you start planning the menu, be sure to include a few items with our chorizo sausage. Spicy foods can add a little kick to any get-together. Whether you choose a dip, a soup or a pasta dish with sausage, your guests will want to get the recipe. You can send them to our recipes page, where we list dozens of ideas for healthy and fast meals made with our fresh sausage. Browse around our recipes page to find what works for your family. You may discover combinations you had never dreamed of. You may even get new go-to meals from our list of creative combinations. We started our company more than 40 years ago with a simple vision. We wanted to do business in the traditional manner, putting our values ahead of profits like so many family businesses do. Today we continue to strive for the same things we did back then — great food produced by great people for great families. We proudly embrace new ideas, such as environmental sustainability, to help our company move forward. We also encourage our employees to give back. We help with programs such as food banks and Special Olympics because we believe these causes deserve our assistance, as part of our community. We hope you find these ideas as compelling as we do. We invite you to order from us online or find a nearby store. You can always reach out to us on social media — we love hearing from our customers about how they have used our Mexican chorizo in their kitchens.